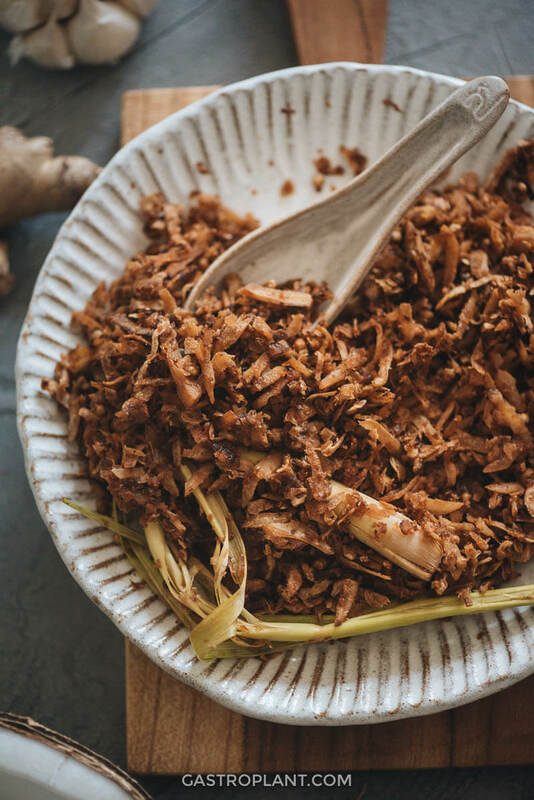 Serundeng is a mixture of shredded coconut, herbs, spices, and tamarind paste, pan-fried and used as a topping or condiment in Indonesian cuisine. 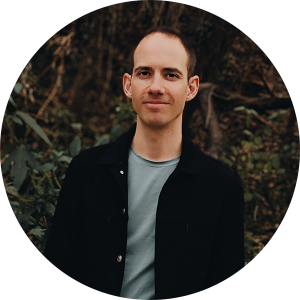 If you’ve never heard of it, don’t be afraid! It’s got a pleasant crispy texture, nutty flavor, and ginger-lemongrass fragrance. It works nicely with many different Southeast Asian dishes. Serundeng? This dish sounds pretty random. How did you come up with this? The existence of serundeng caught me by surprise, but I was glad it found me. I was recently cooking massaman curry based on a recipe from a cookbook. I thought it was unusual that an Indonesian topping would be required for a Thai dish, but I went along with it. As it turned out, the flavor harmonies between the serundeng and the curry were strong. They both use ginger and lemongrass. And the curry features coconut milk, so they also have coconut in common. The serundeng also adds a chewy-crispy texture that went well with the curry, but would also go well with other Southeast Asian dishes. OK, so it goes with Thai curry. Anything else? 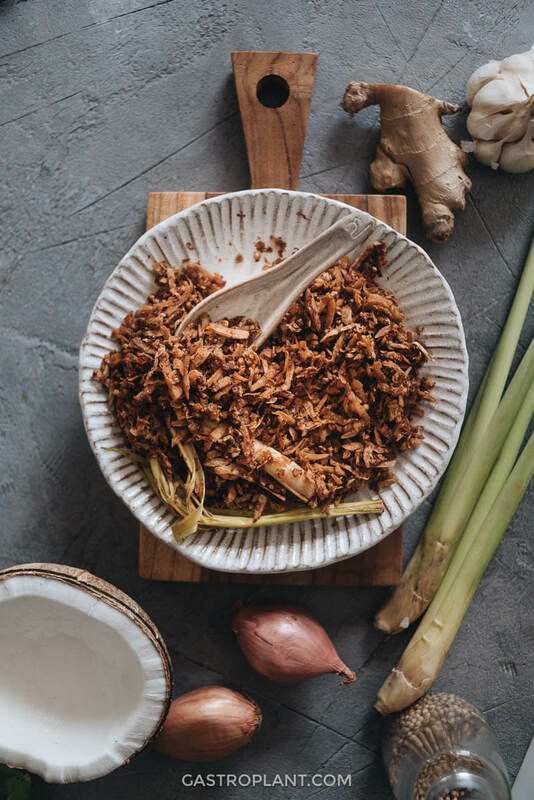 Serundeng is pretty versatile because of its simple flavors and commonalities with other Thai, Malaysian, Indonesian, and even south Indian dishes. I would recommend trying it on Pad Thai, Nasi Lemak, Laksa, and Nasi Goreng. There are also a few Gastroplant dishes I’d recommend trying this with. It would pair well with the flavors in my Curry Tofu Scramble, Turmeric Latte, and the upcoming Vegan Massaman Curry. 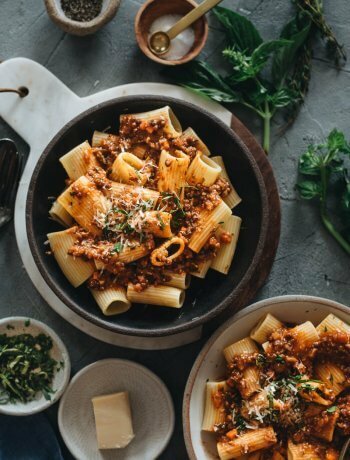 What should I know before I cook? The dish uses shredded coconut. 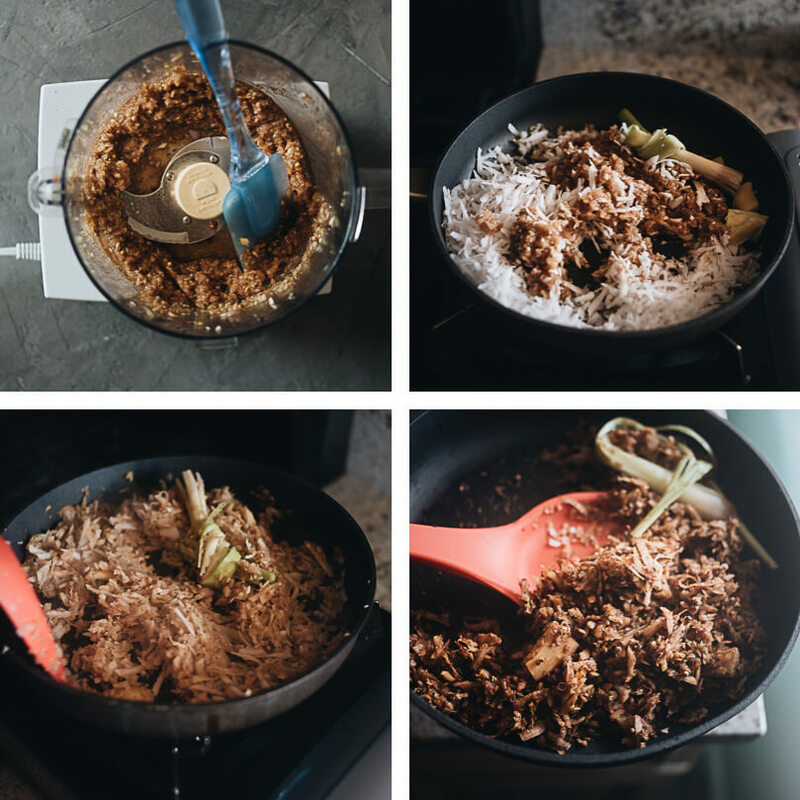 You can either use shredded dried coconut or shred a fresh coconut. Fresh will produce more flavorful results, but dried will cook more quickly. Also, keep in mind that it can be a bit of work to open and prepare a fresh coconut. A spice grinder or mortar and pestle is needed for grinding the coriander seeds. A food processor or large mortar and pestle is needed for turning some of the ingredients into a paste. 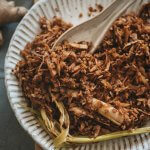 The dish uses tamarind paste and lemongrass, which are not especially common but should be available at an Asian grocery store. 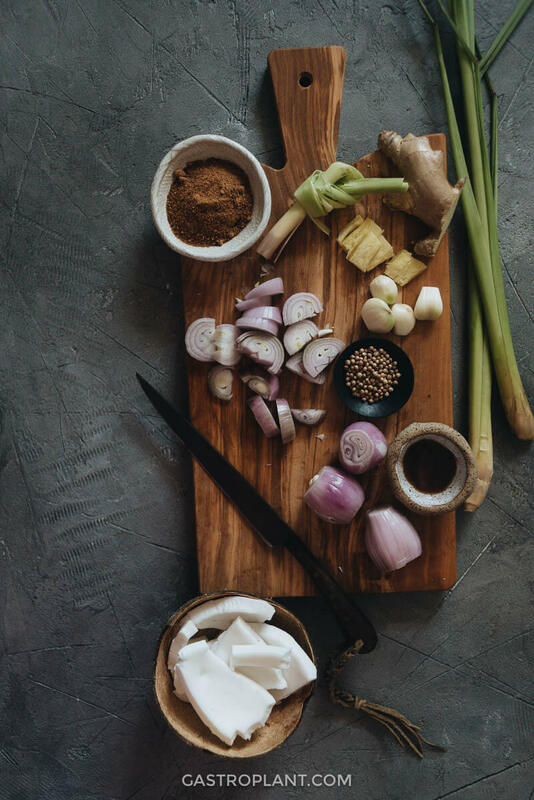 The recipe requires bruising the stalk of lemongrass and the piece of ginger. You can do this by placing it on a cutting board and pressing into it with a thick drinking glass or the flat edge of a knife. Some of the pictures show the lemongrass stalk tied in a knot. The knot-tying was done for aesthetic purposes. You don’t need to tie it. This recipe was slightly adapted from the one in East Meets Vegan by Sasha Gill. Grind the coriander seeds into powder using a spice grinder or mortar and pestle. 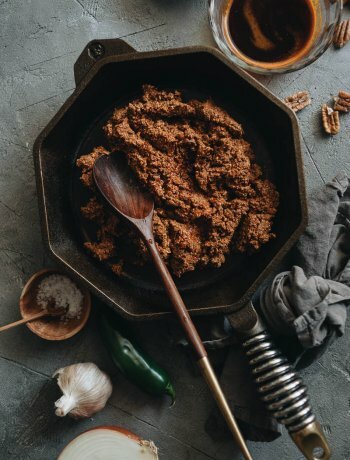 Combine the ground coriander, shallots, garlic, tamarind paste, sugar, and salt in a food processor (or large mortar). Grind until it forms a consistent paste. Scrape the paste into a large nonstick skillet and add the shredded coconut. Heat skillet over medium heat, stirring frequently to mix thoroughly and prevent scorching. When the skillet and its contents are hot, add the ginger and lemongrass and stir well. Continue stirring and cooking until the coconut is well browned and the mixture becomes dry. This can take as long as 20 minutes. It will take less time if you are using dried coconut instead of fresh. You can use dried (desiccated) shredded coconut if you prefer not to deal with fresh coconut. Dried coconut will not be as fragrant but will take less time to cook. 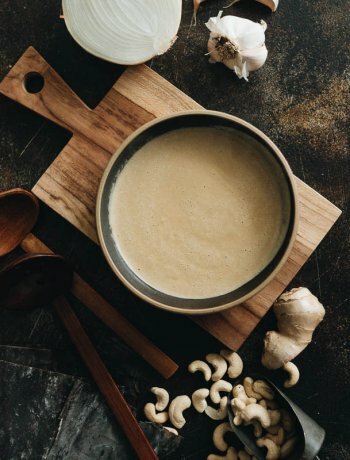 To bruise the ginger and lemongrass, place the ingredients on a cutting board and carefully press into them with a thick drinking glass or the flat edge of a knife. The serundeng will stay good for five days in an airtight container in the fridge.